When it comes to holiday comic traditions, few are as clever, exciting, and chilling as the annual Hellboy Winter Special, featuring exceptional creators telling short stories about the titular demon and other characters in the Mignolaverse. These books go beyond the usual cheerful holiday fare, taking a creepier approach that recognizes that winter can be a pretty miserable time. It’s cold and dark, and different cultures around the world have their own ways of dealing with this chilly season. 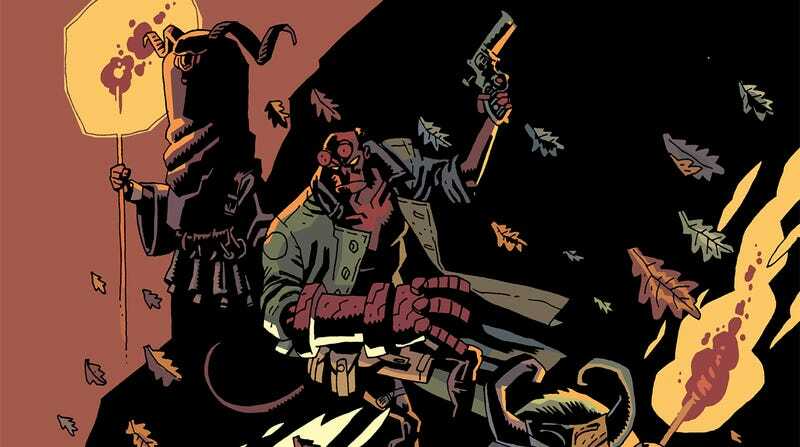 Hellboy Winter Special 2018 features three new tales: Mike Mignola reunites with frequent collaborator Ben Stenbeck to put Hellboy in the middle of a seance that goes predictably haywire; Tonči Zonjić delivers another hard-boiled Lobster Johnson tale that has the vigilante delivering justice to a trio of gangsters during the holiday season; and brothers Gabriel Bá and Fabio Moon bring back vampire Simon Anders to explore a Bulgarian pagan ritual. This exclusive preview of next week’s Hellboy Winter Special 2018 showcases Bá and Moon’s story, introducing readers to the Kukeri, men who wear large animal masks and bells around their waists to scare away evil spirits. This excerpt draws readers into a frigid forest with beautifully atmospheric visuals by Moon and colorist Dave Stewart, who colors all of the stories in the one-shot. They do outstanding work making the natural world come alive, and the designs of the spirits use visual elements of animals like fur coloring and silhouettes as the foundation for the spirits’ humanoid forms. The exaggeration of the Kukeri masks contrasts with the real animal forms to emphasize the artistry of this winter tradition, and a connection can be drawn between the Kukeri’s theatrical interpretations of nature and the ways comic artists amplify the expressions of animals on the page.